Modern scuba diving gear consists of one or more gas tanks strapped to the divers back, connected to an air hose and an invention called the demand regulator. The demand regulator controls the flow of air so that the air pressure within the diver's lungs equals the pressure of the water. Ancient swimmers used cut hollow reeds to breathe air, the first rudimentary snorkel used to enhance our abilities underwater. Around 1300, Persian divers were making rudimentary eye goggles from the thinly sliced and polished shells of tortoises. 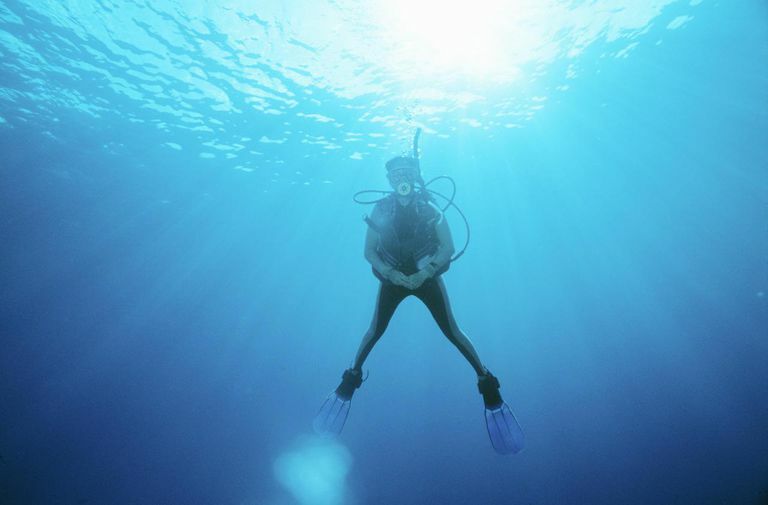 By the 16th century, wooden barrels were used as primitive diving bells, and for the first time divers could travel underwater with more than one breath of air, but not much more than one. In 1771, British engineer, John Smeaton invented the air pump. A hose was connected between the air pump and the diving barrel, allowing air to be pumped to the diver. In 1772, Frenchmen, Sieur Freminet invented a rebreathing device that recycled the exhaled air from inside of the barrel, this was the first self-contained air device. Freminet's invention was a poor one, the inventor died from lack of oxygen after being in his own device for twenty minutes. In 1825, English inventor, William James designed another self-contained breather, a cylindrical iron "belt" attached to a copper helmet. The belt held about 450 psi of air, enough for a seven-minute dive. In 1876, Englishmen, Henry Fleuss invented a closed circuit, oxygen rebreather. His invention was originally intended to be used in the repair of an iron door of a flooded ship's chamber. Fleuss then decided to use his invention for a thirty-foot deep dive underwater. He died from the pure oxygen, which is toxic to humans under pressure. In 1873, Benoît Rouquayrol and Auguste Denayrouze built a new piece of equipment a rigid diving suit with a safer air supply, however it weighed about 200 pounds. Famous magician and escape artist, Harry Houdini (born Ehrich Weiss in Budapest, Hungary in 1874) was also an inventor. Harry Houdini astonished audiences by escaping from handcuffs, straitjackets, and locked boxes, often doing so underwater. Houdini's invention for a diver's suit permitted divers, in case of danger, to quickly divest themselves of the suit while submerged and to safely escape and reach the surface of the water. Emile Gagnan and Jacques Cousteau co-invented the modern demand regulator and an improved autonomous diving suit. In 1942, the team redesigned a car regulator and invented a demand regulator that would automatically fresh air when a diver breathed. A year later in 1943, Cousteau and Gagnan began selling the Aqua-Lung. Is It Safe to Dive on Decongestant Medication?